Avi Vantage supports VLAN trunking on bare-metal servers. If the Avi Controller is deployed on a bare-metal server, the individual physical links of the server can be configured to support 802.1q-tagged virtual LANs (VLANs). Each VLAN interface has its own IP address. Multiple VLAN interfaces per physical link are supported. 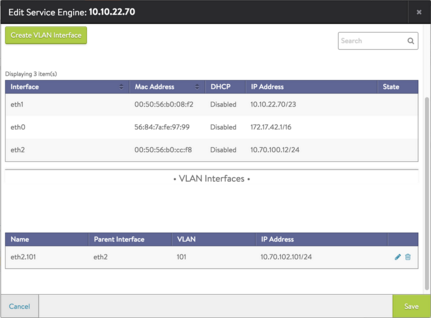 Note: Avi Vantage supports VLAN interface configuration on Linux server cloud as well. The UI configuration remains the same as explained in this document. Navigate to Infrastructure, and click on the Service Engine (SE) where the VLAN interface is to be created. Click the Edit button, and the following pop-up window appears. Select the parent interface from the drop-down list, and fill in the VLAN and IP Address fields, then click Save. 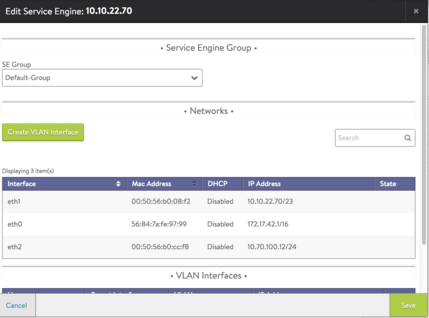 The VLAN interface appears on the Service Engine Edit page. Click Save again to commit the change.